You don’t need me to tell you that a responsive email list is the key to winning clients and selling products online. For every clickbait headline from some attention-seeking guru proclaiming that email marketing is dead, there’s a ton of studies and analysis showing that email still drives exponentially more sales than any other channel, and is the preferred method of business communication across all age groups. But, of course, knowing that building a responsive email list is key to your success and actually building one are two very different things. In my early days online I did what most people do. I put a nice little “Subscribe to my Newsletter” box in the sidebar on my blog and waited for a flood of subscribers to come rolling in. And there was far less competition back then, certainly in terms of people providing tips to consultants, coaches and other professionals about getting more clients. It's even tougher to get subscribers today. 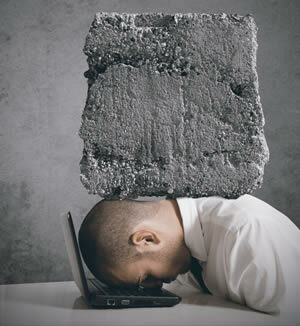 Today in almost every niche you can’t move for falling over newsletters and email courses. Today you have to work a lot harder to get the right email subscribers. “Subscribe to my Newsletter” doesn’t cut it anymore. Nor does a simple box in your sidebar. In this blog post, you’ll discover the three most important factors when it comes to turning visitors into your website into email subscribers. Get these three right as some of my students have done and you’ll often double or triple your email signup rate. Sounds obvious, but most people don’t put nearly enough thought into what would motivate their ideal client to sign up for regular emails from them. The prospect of a “newsletter” won’t do it. No one wants your news. They want value. They want actionable information. They want it now. So the first component of a Powerful Reason To Sign Up is an effective Lead Magnet. Something free you give away as an incentive to get people to subscribe. Yeah – we all know about having a good lead magnet. But look around the web and you’ll see that most lead magnets are actually pretty weak. A good lead magnet needs to hold out the promise of immediate value. Your potential clients surfing the web aren’t looking for an encyclopaedia to read or a 27-week training program to enrol in. In fact, most of the time they’re not looking for anything related to what you do. To catch their attention and to motivate them enough to sign up it has to be instantly clear to them that they’ll get something of immediate value. Now I know you probably do the sort of work that takes time and effort to deliver big results. But think of your lead magnet as a kind of painkiller. If you go to the doctors with a murderous headache you don’t want her to tell you that you need to improve your diet, get more sleep and exercise more – even though those are probably the things that will stop the headaches long term. Right now you just want something to stop the pain. Only after the fist-fight in your head has subsided will you be ready to accept advice about what to do to stop it coming back. It’s the same with your lead magnet. Solve an immediate problem that lies on the path to your ideal client’s long-term goals and they’ll be willing to listen to your bigger ideas. My current primary lead magnet, The 30 Minute Marketing Plan Checklist works well for this. The benefit is clear: it’s a checklist that shows you what you need to do to get more clients without spending all your time on marketing. And because it’s a checklist, it's obvious that you'll get value from it quickly without having to wade through a huge document or video. How effective is your lead magnet? Do your potential clients immediately raise an eyebrow and think “I need that”? The second component of a Powerful Reason To Sign Up is the implied value of your emails. You don’t want people to sign up for the lead magnet and then immediately unsubscribe because they see no value in your ongoing emails. You want them to sign up and look forward to your emails. A simple tip here is to name your emails in a way that makes the benefit obvious. No one wants a newsletter, but they might want to get your Client Winning Tips as my emails are called. The quality of the content on your site also gives clues to potential subscribers as to what your emails are going to be like. If your blog posts and videos are insightful, interesting and entertaining then they’ll expect that your emails are the same. And including comments and testimonials from delighted subscribers who’ve got great results from your emails will encourage them further. 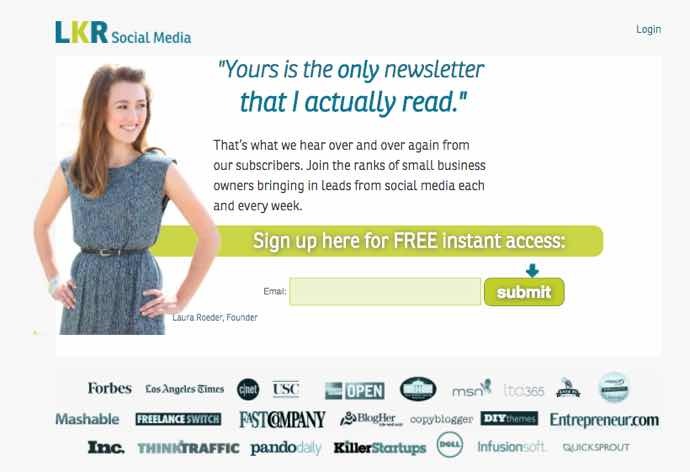 Laura Roeder’s site (screenshot below) is a great example of using a testimonial and social proof (the logos of media she's featured in) to encourage email subscribers. And finally, the words you use to describe your lead magnet and emails and give instructions to your visitors can influence its perceived value. Instead of asking them to “Subscribe Now” or “Submit”, say they can “Get Free Instant Access” or “Send Me My Free Sales Tips”. 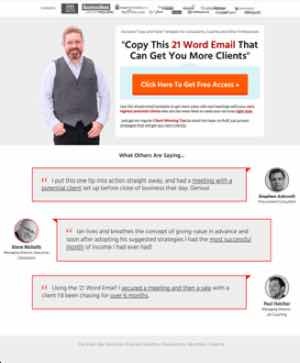 Ideally, the name of your lead magnet itself will imply value (like my old lead magnet, “The 21 Word Email That Can Get You More Clients” or Digital Marketer’s “Ultimate Facebook Ad Template Library”). But if not, add bullet points to make the benefits they’ll be getting clear. With traffic to your site from search engines or social media, you can’t completely control which page a visitor will land on. But when your traffic comes from paid ads on Facebook, Adwords or other platforms, or from links in guest articles or where you’ve done a podcast or interview or otherwise been featured on another site; you can specify exactly where that traffic lands on your site. In these cases, you must make sure that visitors land on a page that’s optimised to get them to sign up to your emails. Not a blog post (unless you’re deliberately sending them to content and then retargeting them to an opt-in page later). Not your home page (though you’d be surprised how many big organisations throw away money on pay-per-click doing exactly that). And not a normal page on your site you’ve added an opt-in form to (yeah, I’m talking to you Mr “It’ll Be Fine, No One Will Notice”). A properly optimised landing page with the sole purpose of getting an email signup. A good home page might get a 10% opt-in rate. A blog post 1-3% (maybe 10-20% if you have an excellent content upgrade offer). But a dedicated landing page should get you a 40% optin rate or more. My usual landing pages for cold traffic from Facebook Ads typically get a 58% optin rate. And that jumps to 77% for partner traffic. Of course, part of the reason it’s higher is that the traffic is high quality and pre-qualified to want to sign up due to the targeting. But a lot of the reason is that the landing page has been carefully designed to motivate people to sign up. It has a strong headline and clear call to action. There’s social proof and testimonials. There are no prominent menus, distractions or other links away from the page. And the button to sign up is highly visible. You can build Landing Pages like this using tools like Thrive Landing Pages and Leadpages. Leadpages tends to be more template-driven, faster to get pages up and running, but more expensive and less flexible. Thrive Landing Pages is dirt cheap, very flexible, but with fewer built-in templates to choose from. Whichever route you go down, make sure you’re using dedicated landing pages. You can get a detailed breakdown of my best performing optin page with a guide to all the key elements on why they work by clicking here. As I said for driver #2, sometimes you won’t be able to direct traffic exactly where you want it. Visitors from social media will go to the blog posts that have been shared on your site. Visitors from Google will go to whatever page Google indexes for their search term. And a lot of visitors will just go straight to your home page. That means that in addition to your dedicated landing pages, you need to make sure that the other key pages on your site are also optimised to get emails subscribers. Your first priority is to optimise your homepage as this is usually the most visited page on your site. As discussed in detail in my article on the 9 Biggest Web Design Mistakes, I recommend a “layered design” for home pages. And to maximise email signups, the top layer should be focused on encouraging visitors to sign up for your emails. 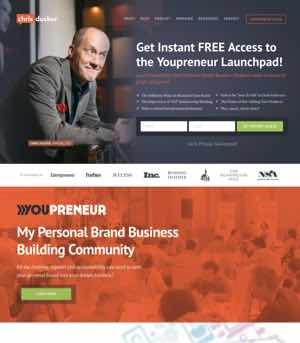 Chris Ducker does a great job of this on his page with a big offer for his Youpreneur Launchpad. Some WordPress themes come with a “feature box” or large homepage opt-in section built in. You can also use tools like Leadpages or Thrive Landing Pages to replace your theme home page with a specially designed home page focused on getting subscribers (I use Thrive Landing Pages for this myself). Or you can use the Plugmatter Optin Feature Box plugin to add a big homepage opt-in form to most themes. Next priority is to consider using a popup or “welcome mat”. Now I know you hate popups yourself because they get in the way of the content you want to see. And people will complain about them. But they absolutely work in terms of getting subscribers. And despite the hordes of people telling you that they result in “lower quality subscribers”, no one has been able to show any evidence that that’s the case. My experience has been that a welcome mat – as pioneered by Sumo but also available in Thrive Leads – works almost as well as a popup, but doesn’t generate anywhere near the level of annoyance. Maybe it’s because you see the content scrolling down rather than being obscured by the popup that you know you can easily get to it. For example, here's a welcome mat I used successfully to promote my 5 Day Authority Challenge. Or alternatively, you can use an exit intent popup which only shows when someone is leaving your page – so it doesn’t get in the way of them reading the content. Do be aware though that Google have announced that they’re going to start penalising sites in the mobile search rankings if the content is obscured by “intrusive interstitials” – basically anything that obscures the content that was clicked for. Thrive Leads have a feature that allows you to show a full lightbox popup or welcome mat on desktop, but a smaller ribbon overlay on mobile so that you're complying with Google's rules, but maximising your email signups. Make sure the tool you use has a similar ability to show something different on mobile. And make sure you’re not showing popups or welcome mats on pages you send paid traffic to. Both Google and Facebook’s advertising platforms frown on it. In the sidebar for blog posts. Personally I don't use a sidebar, but if you do I recommend using the Q2W3 Fixed Widget plugin for WordPress which allows you to “freeze” the opt-in form in your sidebar so it remains visible after a visitor has scrolled beyond the bottom of the sidebar. You can see it in action to the right of this post. Beneath each blog post. Someone who has gone to the effort of reading all of your blog post is probably pretty interested in the topic you’ve written about. So offer them the chance to get more of your best material by signing up for your emails. You can add an optin box to the bottom of each post with most plugins like Thrive Leads, or you can use a scroll-triggered box which appears when the visitor has scrolled a certain way down the post (I prefer not to use this option as I reserve the space for my chat widget). Via Content Upgrades. A content upgrade is a bespoke lead magnet that’s specific to a blog post or other piece of content. So rather than offering your general lead magnet, you offer something more relevant. An easy way to do this is to take your blog post and turn it into a PDF with extra details in it – hence “content upgrade”. If the content upgrade is highly relevant to the article it’s being offered with then you’ll get a much higher than normal optin rate. You can either create your own boxes and forms for content upgrades like I do with Thrive Leads or there's a dedicated plugin which will do it for you called Content Upgrades Pro. With all these forms, you’ll want to make sure they really stand out from the rest of the site so they get noticed rather than ignored. Use contrasting colours or an image of the lead magnet. You can also squeeze out a few more signups by having opt-in forms on your About Me page, doing collections of your best posts on a topic with an opt-in form, and using things like Wistia Turnstile to collect email addresses in videos you create. But these are in the “nice to have” rather than “must have” category. The core opt-in opportunities are your home page, popups/welcome mats, sidebar and below post opt-ins and content upgrades. So, Are You Following These 3 Steps To Get More Email Subscribers From Your Website? If not, which step are you missing? Need a more powerful Lead Magnet? Check out my tutorial on the 7 Characteristics of a Perfect Lead Magnet here. Need to create an effective optin page or beef up an existing one? You can get my detailed breakdown of my best performing optin page by clicking here. Need to make the key pages on your website more effective at getting email subscribers? You might want to jump straight into my Build Your Own Client Winning Website course. Right now it's on special offer for just $47 here (less than half price). 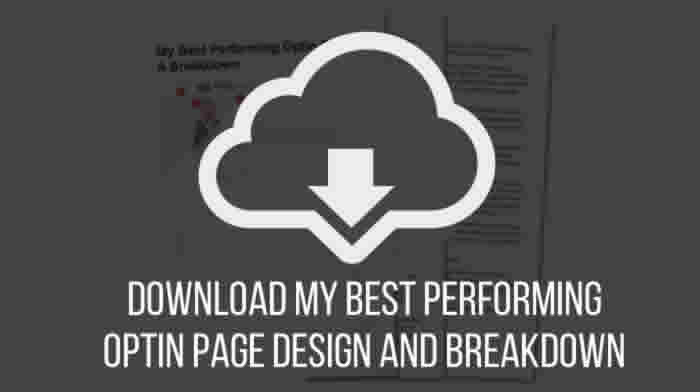 Want a Guide to My Best Performing Optin Page with a Breakdown of the Key Elements? PS The Email Marketing System I recommend and use myself is Active Campaign. Next: Being Seen as an Expert Won’t Win You Clients. Here’s Why.